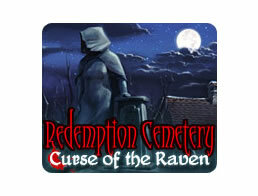 Redemption Cemetery: Curse of the Raven Game - Download and Play Free Version! Use your wits to escape a haunted graveyard and put the ghosts to rest! Redemption Cemetery: Curse of the Raven is a hidden-object mystery game that tests both your powers of observation and your puzzle-solving skills. Richly illustrated game environments, careful attention to detail, and haunting music make Redemption Cemetery: Curse of the Raven an immersive experience as well as a game. You begin Redemption Cemetery driving on a twisting road at night. Suddenly, you lose control of the car and awaken in an eerie graveyard as the gate swings shut behind you. 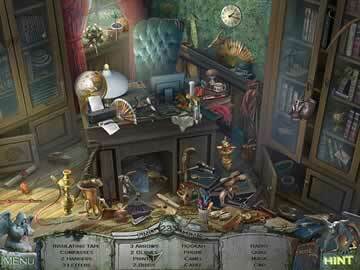 You're trapped and must find your own way out using a combination of finding secret objects and solving puzzles. In doing so, you free the souls of spirits trapped in the cemetery as well. Hints are on a timer, but are unlimited, so you'll never find yourself irrevocably stuck. Divided into three "novellas", Redemption Cemetery: Curse of the Raven features a point-and-click interface that long-time gamers will find familiar and novice players will quickly understand. 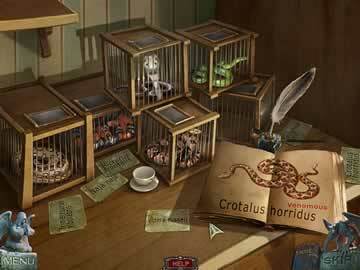 There's an additional Collector's Edition that provides a bonus adventure and new game environments. Redemption Cemetery offers hours of eerie, atmospheric gameplay.